Indego launches tomorrow. Are you ready? Philadelphia’s long-awaited bike share network launches tomorrow with a ceremonial ride-off from Eakins Oval. 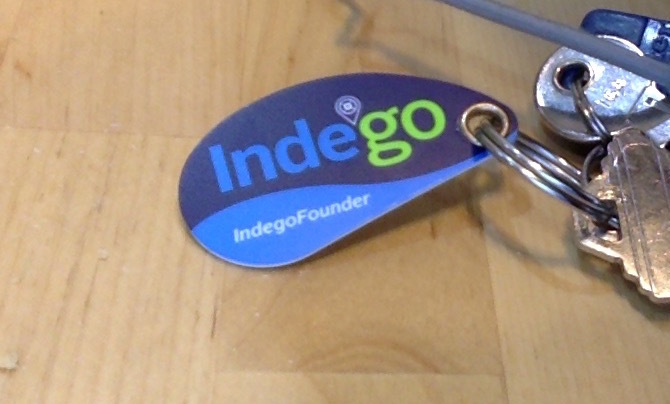 Indego Founder keyfob. That’s right. It’s here. It’s finally here. GET HYPE. Indego’s initial station map. Click for live version. YOU ARE NOT HYPE ENOUGH. GET MORE HYPE. Posted on Wednesday 22nd April, 2015 Categories Bike sharing2 Comments on Indego launches tomorrow. Are you ready? The heart of this tweet is the fear of getting a good idea, bike share, embroiled in an extended NIMBY fight energized by idiots who hold “a cost-free street parking spot” on their own list of rights, right after (or before) speech, religion, assembly, and non-self-incrimination. Fighting idiots is necessary, but creates delays and just feels like a demoralizing waste of resources. I would suggest simply going around the parking-worshippers and siting bike share pods by simply asking for volunteers. There are plenty of enlightened property owners and/or tenants out there who understand that a bike pod in the parking lane in front of their building adds far more value than a car. Just ask those people or businesses to come forward. The city can then distribute many (most?) of the pods where they will be guaranteed not to be offensive to the immediate neighbors. Indeed, it would make for an effective publicity campaign to base the process around the loudly stated assumption that there will be more demand for a pod than pods to be distributed. Make it a desirable status good, not a sacrifice; if you want to be really cheeky, auction the pods in the most oversubscribed locations. And let the smart businesses reap the benefits of their early adopterhood. One of the things I missed when I was out of town last month was the announcement of the City’s new bikeshare program (about time! ), with rollout scheduled by Spring 2014. The Mayor’s Office of Transportation and Utilities (MOTU) is taking the lead on the two year standing-up process, in which time it hopes to leverage $3MM in city money into raising $6MM in outside funds, to finance a network of ~1100 bikes between Vine, South, and 41st (with a few in a satellite cluster around Temple’s campus). Unsurprisingly to anyone who has seen the explosive success of bikeshare programs throughout the world, much of the early criticism of the project has been that the initial rollout is much too small (650 bikes in the first year), and almost certain to be oversubscribed at peak hours. Similar outcry has come over the circumscribed boundaries where pods will be found: Center City and the campuses get an amenity, but not the neighborhoods that can provide all-hours usership. Well, count me in as well, on both criticisms. Now, I understand that the number of pods the city can afford necessarily defines the boundaries. The density of pods needed for the system to be convenient and effective seems to be fixed, and very high, based on global experience. The City cannot skimp on pods in Washington Square to provide bikes to Queen Village without harming the system. But to me, this is an argument that the City needs to assemble more money to go forward. Politics may be the art of the possible, but while City Council is burning over $1MM to squat on property in Point Breeze, it might decide to begrudge the Mayor enough cash to launch bikeshare properly. What am I defining as “properly”? Glad you asked. Bikeshare, while it’s certainly usable for commuting, is meant to be more of a casual trips and errands service: rent a bike for a 15 minute trip one way, then return in the other direction when you’re done, with only mild peaks in usage by hour or direction. I dispute that Center-City-and-Campuses-Only is going to attract much additional bike usage; most trips wholly within that catchment can be made best by walking, and the rest can be made by subway or bus. 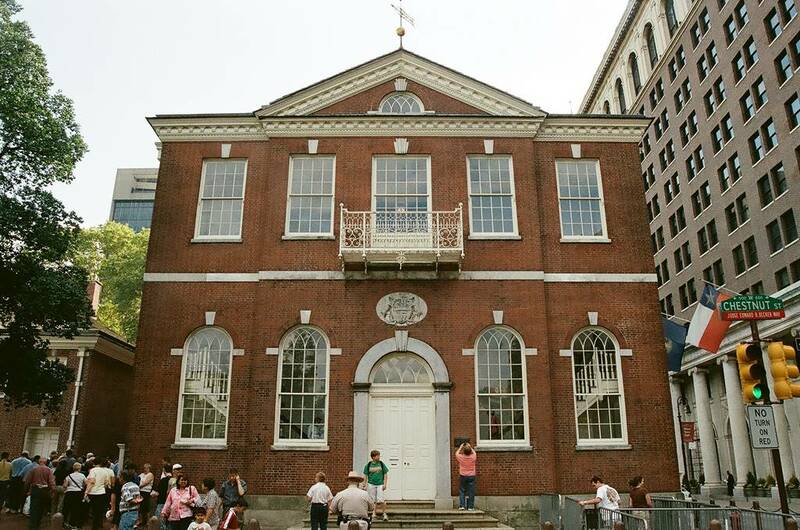 That ability is why Center City is so attractive (and so expensive) in the first place. Serving adjacent neighborhoods, where the origins and destinations spread out a bit, is more in the sweet spot for the bike mode, especially on “crosstown” trips like Graduate Hospital to University City, or Northern Liberties to Fairmount. Without one or both endpoints in Center City’s density, more trips end up like these, a bit far (though not impossible) to walk, and with SEPTA’s hit-or-miss crosstown bus service as an unappealing alternative. (I challenge you to argue that service on either the 40 or 64 is good. I need a laugh today.) Even trips between Center City and the adjacent neighborhoods by bus can be rather unpleasant, given buses crowded with riders traveling longer distances (the 17 is nearly useless north of Christian St during rush hour, packed to the gills with Point Breeze and Girard Estate riders). I recommend that any bikeshare network aim to have sufficient coverage from Girard through Washington east of 52nd (plus Temple) by the middle of its second year. That would be a good basis for a well-used — and therefore high revenue-earning — system. 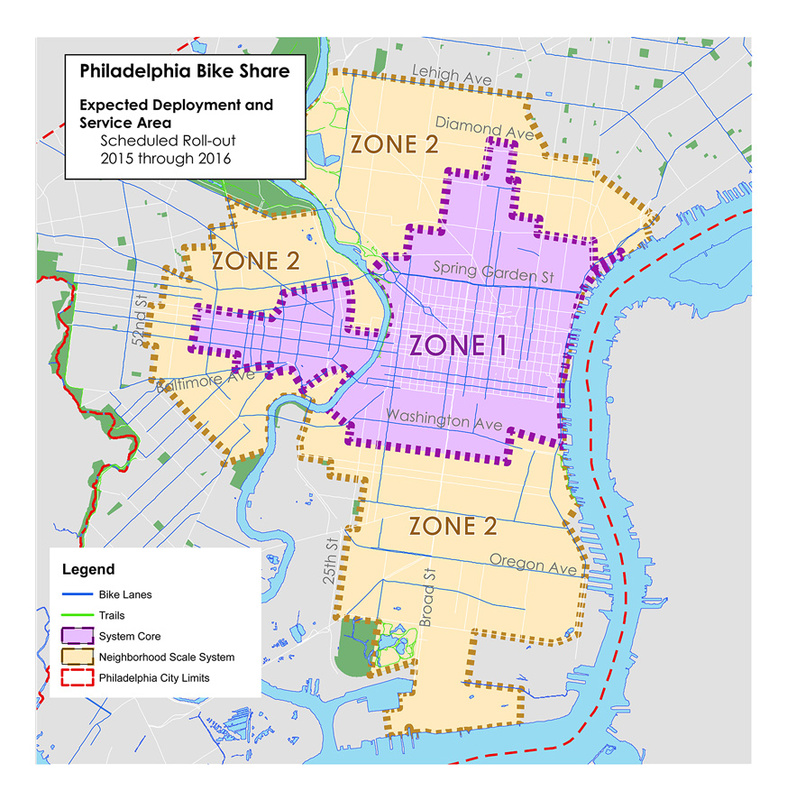 It would vastly increase the bicycle mode share, and take a lot of pressure off local SEPTA routes that need it most. In fact (and this is a novel suggestion that will probably brand me forever a heretic at Bicycle Coalition HQ), SEPTA may want to run the bike share program, or at least integrate membership into its fare structure. 1234 Market St. may have the most to gain from seeing bike sharing become a runaway success, eroding car ownership in the city while reducing its own cost of providing quality service to the region’s core.